Graham and June Round and Michael and Marion Round. An interesting, heart-warming event took place at All Saints School today: a needlepoint picture of All Saints Church, created by the daughter-in-law of a former Gresford resident, was donated to the school. The expert craft handiwork was carried out in 1996 by Mrs Marion Round as a gift for her mother-in-law, Mrs Dorothy Round, who attended the school with her brother and sister in the 1930s, and lived on Pant Lane. Her two sons, Graham and Michael, were christened in the church. Dorothy passed away a year ago and Mrs June Round, wife of Graham, contacted Image seeking help in locating a suitable place for the picture to be displayed. The picture was first seen in the village in the Image stand at the Gresford Festival in August where it attracted quite a lot of attention. Contact had already been made with Mr Glyn Williams, Head of the school, and he readily agreed to accept the picture for display there. 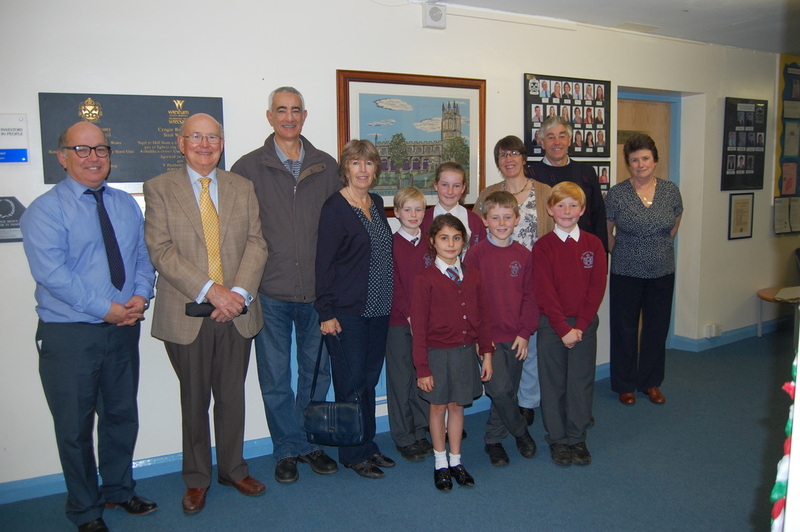 So it was that Mr and Mrs Michael and Marion Round, Mr and Mrs Graham and June Round, Graham Frank-Keyes (chair of Image), Mrs Rowlands and Mrs McDonald (school governors) and five pupils, together with Mr Williams were present at the unveiling of the picture. It is quite a large needlepoint, well-framed, representing the church very skilfully. Image would like to thank all members of the Round family: Mrs June Round for making the contact and carrying it through, Mr Williams for accepting the donation, and for his interesting guided tour of the school and his hospitality, and especially Mrs Marion Round for her artistry and handiwork in creating the picture. We are sure it has found a very suitable location and that it will bring warmth and inspiration to generations of school children and visitors for years to come. Pictured here at the presentation are the Headteacher, Mr G Williams, Mr G. Frank-Keyes, Chair of IMAGE, pupils of the school, the Round family and Mrs J. Macdonald, school governor.